2018 is an amazingly strong year for movies, and that means the Oscar competition is going to be particularly intense. In a field dominated by powerful contenders, from A STAR IS BORN to ROMA and VICE, one movie is creeping in as a likely nominee in a variety of categories. 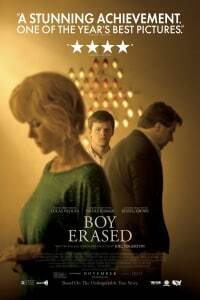 BOY ERASED, the film based on Garrard Conley’s memoir of experiencing gay conversion therapy at the behest of his family, could be a strong awards player. Directed by actor/filmmaker Joel Edgerton, who previously made the effective thriller THE GIFT, this movie has a cast and script that could walk away with multiple Oscars. Let’s look into BOY ERASED’s chances. This year has been good for actor Lucas Hedges. 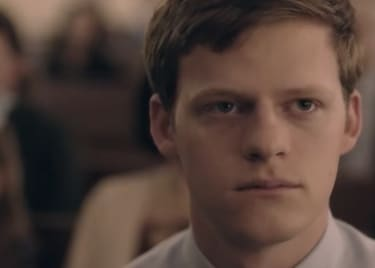 In BOY ERASED, he plays Jared Eamons, a fictionalized version of Conley. Jared lives in a small community. His parents, played by Russell Crowe and Nicole Kidman, are strict Baptists — his father is even a preacher. The family can’t accept Jared’s sexuality, and pushes him into conversion therapy. Hedges shines in the lead role. Jared’s experience is even more difficult than our brief synopsis suggests, but we don’t want to give away every detail of the film. Hedges brings a deeply empathetic sensibility to the movie. BOY ERASED turns entirely on his performance, and the film’s success — and it’s deeply emotional impact — are due to Hedges. He’s an easy guess for a Best Actor nomination. It doesn’t hurt that Hedges is great in two more movies this year. There’s Jonah Hill’s MID90S, in which Hedges plays the violent and domineering older brother of the main character. He’s also terrific in BEN IS BACK, directed by his father Peter Hedges. In that film, Hedges plays an addict who tries to get his life back on track after rehab, with the help of his mother, played by Julia Roberts. BOY ERASED is the most likely performance to be nominated, but having those other two great roles this year makes Hedges an even stronger contender. The rest of the BOY ERASED cast is just as strong. 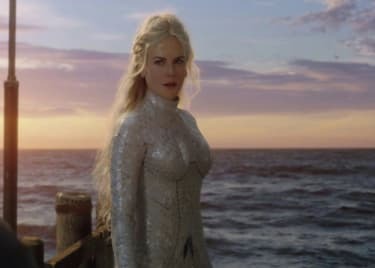 Nicole Kidman is also having an amazing 2018, and her work as Nancy Eamons is among her best. While Hedges carries the entire movie, Kidman’s role represents the evolution of her family and community — in many ways she has the biggest arc of the film. If Kidman wasn’t already looking like a lock for a Best Actress nomination for DESTROYER we’d put all our money on a Best Supporting Actress nomination for BOY ERASED. It could be that both will happen! The rest of the supporting players, including director Xavier Dolan and actors Troye Sivan and Joe Alwyn, effectively bring their own unique notes to the true tale. While the Best Adapted Screenplay category will be stacked, there’s a good chance that BOY ERASED can compete there, too. While some of the adapted films this year have faced controversy for deviating too far from reality and/or their source material, this movie doesn’t have that problem. It treats Garrard Conley’s story well, and persuasively argues the dangers of conversion therapy. With all of the obvious strengths of BOY ERASED, the film’s Oscar chances are significant. And we can’t discount the fact that the film comes from Focus Features, and the company is very capable at mounting a strong awards campaign. The distributor will also be pushing Spike Lee’s BLACKKKLANSMAN, but that film and Edgerton’s movie can stride towards the Oscar stage side by side.